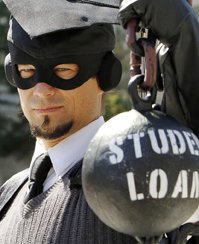 Is the college-loan system fair? As Congress tries to reduce the federal debt, it is forcing federal loan and grant programs for higher education to fight for scarce dollars. In negotiations this summer over the debt ceiling, lawmakers shifted money from loan programs for students who borrow for graduate and professional school and students who pay back loans on time to Pell Grants for low-income students. The government has implemented several new programs to make the loan system fairer, including making payments easier for lower-wage earners and providing federal loans directly to borrowers rather than through banks, to avoid subsidizing commercial institutions. However, some consumer advocates say unless education debt can be forgiven through bankruptcy proceedings, as most other debt can, the system will never be fair to student borrowers. Meanwhile, tuition continues to rise, and total higher-education debt has surpassed credit-card debt for the first time, rising to $830 billion in mid-2010 and continuing to climb.